Stately and distinctive, the California fan palm is one of the most widely grown palms in subtropical climates. California fan palm can grow 60 ft (18.3 m) tall with a crown spread of 15 ft (4.6 m). The massive gray trunk is barrel shaped and ringed with old leaf scars, and may reach over 3 ft (0.9 m) in diameter at its widest point. California fan palm can have up to thirty gray-green palmate (fan-shaped) leaves, each 3-6 ft (0.9-1.8 m) across. They spread out to form a loose and open crown. The petioles (leaf stems) of mature palms are armed along the margins with curved thorns; those of young palms are largely unarmed. The individual leaflets are pendulous and swing freely in the wind. Abundant cotton-like threads on and between the leaflets persist even when the palm is mature. If old leaves are not removed, they form a continuous "petticoat" from the crown all the way to the ground. The California fan palm produces numerous branching flower clusters that project out and often downward from the leaf crown. The bisexual blossoms are white and yellow and give rise to oblong or round red-black fruit, each about a 0.5 in (1.3 cm) in diameter. The fruits of California fan palm contain a single seed, approximately 1/4 in (0.6 cm) in diameter. 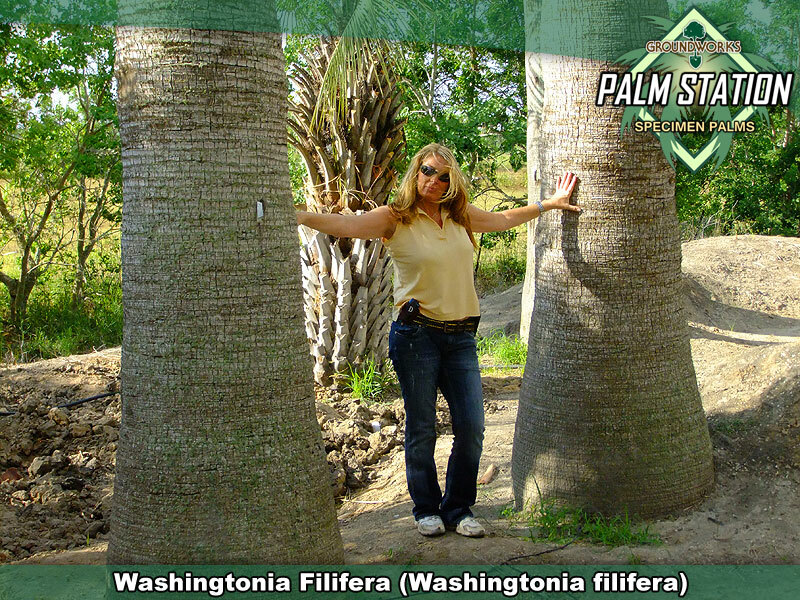 The Mexican fan palm (Washingtonia robusta) and the California fan palm are closely related and quite similar. They differ in subtle characteristics, and even palm experts have trouble telling them apart. California fan palm grows naturally in desert and arid regions, along streams and canyons, and in open areas where groundwater is present in southern California, western Arizona, and Baja California in Mexico. This widely grown palm succeeds admirably in a wide range of soils and climates. California fan palm can grow in extreme alkaline soils that have a pH as high as 9.2. Even large California fan palms can be successfully transplanted. California fan palms respond very well to fertilizer. A slow release fertilizer may be used during the summer growing season. Some growers fertilize their palms monthly with a general purpose plant food or a plant food specifically formulated for palms. One enthusiast used a monthly application of Miracle Grow fertilizer to grow a California fan palm with a trunk diameter of 40 in (101.6 cm) - the largest known. The vigorous and robust California fan palm is considered very disease and pest resistant, and is quite resistant to lethal yellowing disease. As with other palms, potassium and magnesium deficiencies may occur in California fan palms and mineral supplements should be administered in recommended amounts to prevent or treat such deficiencies. California fan palm prefers exposure to full sun and even quite small specimens will thrive in full sun. It also grows well in part sun/shade. Once established, California fan palm is drought tolerant, but it benefits greatly with regular watering. For optimal growth, soil should be moist with good drainage. USDA Zones 8B - 11. Established California fan palms can withstand frosts and freezes. Reports of cold hardiness for the California fan palm indicate the tree withstands 15 to 20ºF (-9.4 to -6.7ºC) with only minor foliage damage. 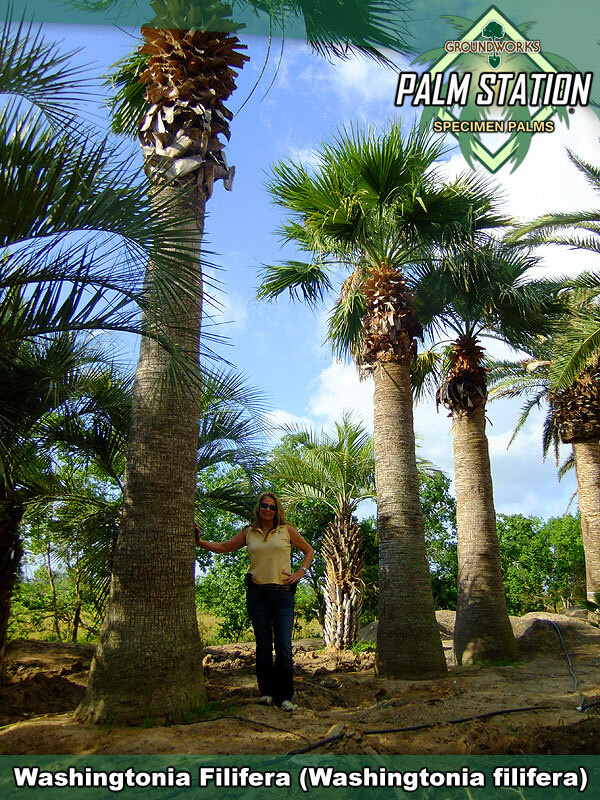 Many enthusiasts are now growing and recommending the California fan palm in USDA Zone 8A. Mature and established plants have survived -11º F (-11.7ºC), but such very low temperatures can be expected to cause major and significant foliage damage. Palms in fast-draining soil are more cold hardy. During the winter, leaves may become temporarily discolored by damp cold and frost. California fan palms can withstand extreme heat, too, including temperatures up to 127ºF (52.8ºC). California fan palm is easy to grow from seed. Even old seeds are reported to germinate well. Germination is considered so easy that young plants may become weeds under mature palms. Plant California fan palm outdoors in a site that can accommodate the large head of leaves, and is not directly under power lines or other structures. Use the California fan palm in natural and formal groupings and in large open areas. California fan palm is perfect for street, avenue and parkland planting where it typically is spaced about 30 ft (9.1 m) apart. Young California fan palms also can be grown in pots or tubs on decks or in indoor areas, such as conservatories or atriums that have bright light. The California fan palm has numerous fine attributes including cold hardiness, fast growth and drought and salt resistance. This palm is inexpensive, adapts to most soils, is easy to grow and transplant, and is very hardy. The genus was named in honor of George Washington. The species name, filifera, comes from both Latin and Greek words meaning thread-bearing.